Kevin Gurney is an atmospheric scientist, ecologist and policy expert currently working in the areas of carbon cycle science, climate science, and climate science policy. He has worked in NGOs, think tanks, consulting, and academia and has focused on topics within global change and climate change. 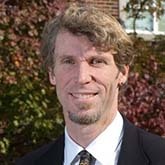 His recent work involves simulation of the global carbon cycle using the inverse approach, characterizing fossil fuel CO2 in North America (the "Vulcan" and "Hestia" projects), the linkages between terrestrial carbon exchange and climate variability, and deforestation and carbon/climate feedbacks. He also has worked extensively on climate policy and has been involved, for over 15 years, with the United Nations Climate Change Framework Convention and the Kyoto Protocol. In addition to carbon cycle science and policy, Gurney has worked on stratospheric ozone depletion, radionuclide dose assessment, energy systems modeling, and climate-economic modeling. Gurney is a member of Phi Kappa Phi honor society, Sigma Xi honor society, the American Geophysical Union, the Ecological Society of America. Gurney is the recipient of the 2010 Sigma Xi "Young Investigator" Award and was one of the IPCC membership that shared the 2007 Nobel Peace Prize with Vice President Al Gore. Gurney was named "Air Conservationist of the Year," by the Indiana Wildlife Federation in 2008 and is a recipient of the prestigious National Science Foundation CAREER award (2009). O'Keeffe, D., K. R. Gurney, J. LIang, R. Patarasuk, J. Huang and M. Hutchins. 2016. Socioeconomic drivers of FFCO2 emissions in the LA Basin: Analysis of the Hestia version 2.0 results. Poster presented at the 2016 Fall Meeting, American Geophysical Union, 12-16 December 2016, San Francisco, California.